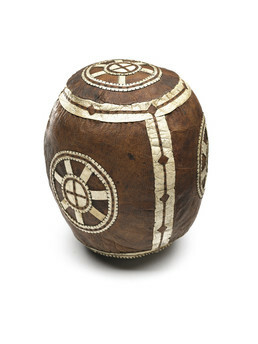 This hand ball is decorated stuffed with reindeer hair and decorated with patchwork designs in bleached sealskin. The ball was used for a traditional game of keep-away between men and women, played to celebrate the first whale of the season. Elders urged the young men to paddle faster on the way back from whaling so that they would not miss the game. Circular designs on the ball represent the sun. Estelle Oozevaseuk: Temngi, amenqun kalleghtaqelghiikut—saaqelghiit aangqameng. Aangqaqayuguut aa, esghaghhu laluramkestun ayuqelghiit. Branson Tungiyan: Yes, this is normally used for what we call men-against-women catch ball. Men would try to take it away when women had the ball, and women would throw it to just the women. And men tried to take it away. And then the men would do the same thing, and women would try to take it away. 1. This ball was discussed along with ball E423976. 2. According to St. Lawrence Island Yupik Elder Vera Kaneshiro, a ball of any kind is called aangqaq. For example, an aangqaq was used for a kick-the-ball game played by girls in the spring during hunting season. This ball, which is decorated with patches of bleached seal skin and stuffed with reindeer hair, is the kind used for a traditional game of keep-away between men and women. (1) Lloyd Oovi remembered that elders urged the young men to paddle faster on the way back from whaling so they would not miss the game. (2) It could be played only after the first whale of the season had been caught.